There are few Dark Shadows spinoffs as ambitious as The Crimson Pearl. I'm hard pressed to think of even ONE trip to Collinsport since 1971 that has been as broad and eventful as this audiobook from Big Finish. It's a story that owes a great deal to modern comicbook storytelling ... the Dark Shadows equivalent of Crisis on Infinite Earths, if you will. Because it's not just a story that spans generations, but timelines, as well. The story follows the path of a mysterious crimson pearl, discovered in 1690 by Isaac Collins as he is bringing his family from England to the colonies. The pearl falls from the sky without explanation and brings doom to almost everyone who tries to possess it. We get a peek into the Collins family in the years before Barnabas Collins (histories stained by tragedy and suicide,) as well as an idea of what happens to Millicent and Daniel in their later years. The pearl eventually falls into the hands of Angelique and ... well, I don't want to spoil things. But it's worth mentioning that Diabolos, Count Petofi, Jeb Hawkes and the Collins family of "Parallel Time" make appearances. It's an incredibly respectful piece of work that isn't moribund in its devotion to capturing the show's tone. The horror elements are genuinely chilling, and the characters are even allowed to progress (as far as the brief vignettes can allow.) A few characters originally played by cast members now deceased also lurk the backgrounds of these tales, which is both haunting and sweet, with the story ending in the years after the series' own demise. "But one day, I am sure I shall return. For much as it is a place filled with horror and intrigue, it is also my home. And, as much as there is darkness, there is also light. For Collinwood is a place where stories happen. There will be more. So many more." It sounds like THE END, right? Luckily Big Finish has several new episodes scheduled to appear in 2012, with The Crimson Pearl's follow ups, The Voodoo Amulet and The House by the Sea, already available. 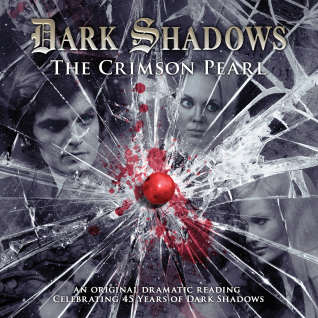 CLICK HERE to get THE CRIMSON PEARL from Big Finish Productions. Dark Shadows official movie site goes "live"
First look at Johnny Depp's "Barnabas" painting? "That was a weird show"
How do you solve a problem like Quentin? New images from the Dark Shadows movie!